New allegations today of sexual assault and misconduct against Brett Kavanaugh - two of these claims were made anonymously. One woman has attached her name, and her lawyer has released a sworn statement. And this all comes a day before Kavanaugh and his first accuser are scheduled to testify before Congress. And it comes on a day that President Trump signaled he believes the allegations are false but also signaled he could be convinced otherwise by tomorrow's testimony. NPR's justice reporter Ryan Lucas is here to give us the latest. And, Ryan, start with the woman making new public allegations. This came out today. Her name is Julie Swetnick. What do we know about her? RYAN LUCAS, BYLINE: Well, she graduated from Gaithersburg High School in Maryland in 1980. That's three years before Kavanaugh graduated from another high school in the same area. Swetnick says in her sworn declaration that she watched Kavanaugh's recent interview on Fox News. She says his professed innocence, his kind of choirboy image and alleged lack of sexual activity is a lie. KELLY: Why? I mean, what actually is she alleging? LUCAS: Well, she says that she was at several parties in years 1981 to about 1983 that Kavanaugh also attended. She says that she saw Kavanaugh get drunk. She says he consistently engaged in what she referred to as, quote, "inappropriate contact of a sexual nature with women." She says he pressed himself against girls, says he was overly aggressive, didn't take no for an answer. She says Kavanaugh's friend, Mark Judge, whose name has already come up in Kavanaugh's confirmation battle, engaged in much of this behavior as well. And she also says that she was raped at a party that Kavanaugh and Judge attended. KELLY: Now, the president has been staunchly defending Kavanaugh. And in a press conference tonight, he did not exactly back down from that, but he did suggest that maybe he's open to reconsidering depending on how tomorrow goes. What did he say? LUCAS: He did kind of allude to maybe he'd be open to it. Here's a bit of what he had to say. PRESIDENT DONALD TRUMP: I'm going to be watching, you know, believe it or not. I'm going to see what's said. So it's possible that they will be convincing. LUCAS: At the same time, though, we really do have to say he called the allegations a con job that's perpetrated by Democrats in order to sabotage Kavanaugh. He said Kavanaugh - again and again he said this - that he's a high-quality guy, one of the most respected people in Washington. 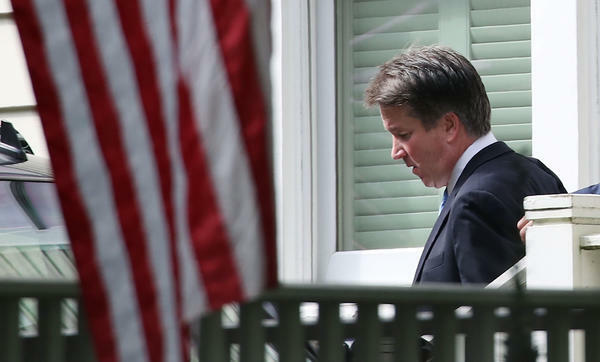 Kavanaugh himself has denied all of the allegations. LUCAS: He said in a statement that the White House put out, quote, "this is ridiculous and from 'The Twilight Zone.' I don't know who this is, and this never happened." KELLY: This material, though, from Julie Swetnick comes not just, you know, in a email or a casual comment she made. She gave a sworn statement under oath. I mean, what kind of legal weight does that carry? LUCAS: Well, certainly more than an emailed statement or just a TV appearance. As one former prosecutor told me, this is the most you can do to show that you believe something is true short of testifying in court. There's the penalty of perjury that kind of hangs over this. And according to the declaration - she also has security clearance for her work - committing perjury could be a career ender in those regards. KELLY: Yeah, she could lose that clearance. KELLY: All right, NPR's Ryan Lucas - thank you so much, Ryan.